Plan a ski trip to Alaska to discover a state full of adventure, great scenery and Eaglecrest Ski Area, a perfect destination for skiing and snowboarding. 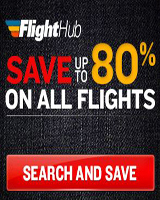 Alaska is known for its open spaces, high mountaintops, and some of the most breath-taking scenery anywhere in the world, plus great snow, amazingly terrain, and it’s just a short plane ride away from Seattle, Washington, on Alaska Airlines, which makes it easy to plan a ski trip to Alaska. In March 2017, Escape2ski packed our bags for a short 4-day (Mar 3 – 6) trip to ski Alaska where we visited Eaglecrest Ski Area, a notable ski area for local skiers and snowboarders, but largely unknown to the rest of the skiing community. Eaglecrest Ski Area is located on Douglas Island, only short drive from downtown Juneau and is the only ski area in the US that is located on an island. After our flight from Vancouver, BC, via Seattle, we landed in Juneau and made the quick 30-minute commute by rental car to the Eaglecrest Ski Area. If you don’t have a car, the Eaglecrest Snowbus is available on weekends to take you to the ski area from a number of pick up locations in the Juneau area. Driving up the access road to the ski area, we could see the slopes in the distance, and we were greeted by a beautiful sunny day and perfect snow conditions that made for two great days on the slopes and a great way to ski Alaska. 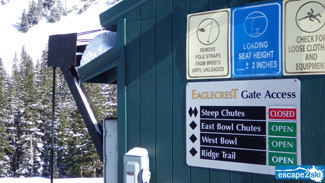 Eaglecrest Ski Area has over 640 acres of terrain, two official alpine bowls, and approximately 36 runs. Although it has a vertical drop of just over 1600ft/488m, the mountain skis much bigger. 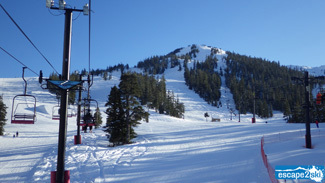 It has a very good mix of terrain and offers something for every type of skier or snowboarder. If you are looking for a challenge, over 40% of the mountain is Intermediate and Expert terrain, however, if you are new to skiing, there is a dedicated learning area just outside the lodge with four runs serviced by the Porcupine Chair. The Ptarmigan Chair will take you to the Eagle’s Nest and the most incredible views of the valley below. From here there is a good selection of black diamond runs to choose from, plus some nice options – Hillary’s or Raven for the intermediate skier as well. The most spectacular views can be found from Pittman’s Ridge. You can access Pittman’s Ridge and the Summit of the West Bowl via a short 15-minute hike with skis or snowboard on your shoulder (there’s no lift service) to the top where you can enjoy an almost 360-degree view of the valley and Young Bay. Escape2ski enjoyed two days of fabulous skiing on this magical mountain, and we never got tired of the scenery, the terrain or the selection of runs. The staff is amazingly friendly, the snow was perfect, and the mountain had an authentic, family-friendly vibe that is genuine and welcoming. Make sure you include it on your itinerary when you plan a ski trip to Alaska. Eaglecrest Ski Area does not offer any slope-side accommodation, however, there is no shortage of accommodation options in Juneau and its surrounding suburbs. Depending on your needs, you’ll find hotels, motels, Inns, B&B’s and more, all situated just a short distance from the mountain. Escape2ski, elected to stay in downtown Juneau, which is the Capital City of Alaska. Here you’ll find all the amenities you are looking for while still keeping true to its historic roots. Make sure you check out historic Franklin Street, which in the early 1900’s was the centre of the cities’ business district. Today you will discover one of the best shopping areas to find that perfect souvenir of your trip, plus great restaurants and authentic bars. Our home for the weekend was the Four Points by Sheraton Hotel (formerly the Goldbelt Hotel), which has amazing views of the Douglas Island, the Gastineau Channel and in the summer the many cruise ships that visit this port. The hotel was within walking distance to a great selection of restaurants, such as The Hanger on the Wharf, which serves fresh Alaskan seafood and much more. When you plan a ski trip to Alaska and the Juneau area, make sure to take some time away from the slopes to see some of the amazing sites, such as the Mendenhall Glacier, which is 13.6mi/22km long and located in Mendenhall Valley, about 12mi/20km from downtown Juneau. When the lake is frozen, you can get very close to the amazing ice that was formed over 3000 years ago. Watch for more detail about Eaglecrest Ski Area when we launch their page on Escape2ski in the fall of 2017.